Ok, for all those who have emailed us about the Tour de France – yes, we are watching the Tour and yes, Tazza D’Oro and Amy are glued to the TV watching the daily races. We prefer the 8pm coverage, but the live coverage usually occurs around 8 -8:30 am. We have the Tour running at all coverage times at Tazza D’Oro and if you click on this link you too can have the coverage times. 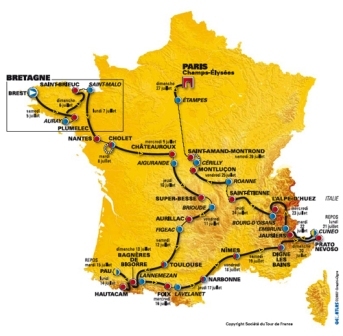 You can also go to the Tour de France web site and check it out when you are “working” – click here . If the TV ain’t on when you come into Tazza D’Oro, hit the power button on the TV and our channel is set for the Tour. Oh, and Maillot Jaune = Yellow Jersey, overall leader of the Tour de France. Although, I prefer the (maillot a’ pois rouges) polka dot jersey = King of the Mountains. Vie le Tour -the greatest sporting event EVER! Check it out.